The complex at Linear is literally second to none, and if you’re after value for money then this is the place for you. Due to the sheer volume of lakes at your disposal you have everything you will ever need for your carp fishing – anything from heavily-stocked waters, ideal for getting bites, all the way up to having the opportunity to catch some of the biggest day-ticket carp in the country. The website that Linear have (www.linear-fisheries.co.uk) is probably one of the best in terms of being informative. Everything you could wish to know before visiting the venue is on there, including up to date catch reports (so you can see exactly what the lakes are producing), plus the rules and pricing for the venue. I would advise anyone before they visit the venue to have a read through the rules. The complex has an on-site shower block which is situated next to St Johns Lake and the bailiff’s cabin. There are also plenty of ‘portaloo’ toilets situated around the lakes. If you’re after finding out extra information and something to give you an edge before making the journey for your session then, over the years, plenty of media material has been produced on the lakes. There are literally hundreds of videos on YouTube that anglers have taken over the years which you can watch, not to mention Korda’s Underwater video’s on St Johns from a few years ago. In relation to gate opening times all the lakes are open for 24-hour a day fishing – they do however lock all the gates at night for security. From March 1st until September 30th all gates will be locked at 9pm and opened again by 8am. From October 1st until February 28th all gates will be locked at 6pm and opened again by 8am – you and your vehicle will be locked inside. This way you know your property is safe and secure and you can enjoy your fishing without any worries. My session started as I arrived at the gates late on a Thursday afternoon, following a long journey down south from Nottingham after work. The main reason for visiting the venue was that Danny Fairbrass and I were due to film for an episode of Thinking Tackle and I wanted a practice run before the shoot. That’s the biggest piece of advice I could give anyone – preparation is key. I hadn’t visited the complex for almost three years and it doesn’t take a rocket scientist to know turning up to any lake blind, without doing any research, will put you on the back foot straight away. Before my session I made sure to do my homework on what was working and which lakes were producing fish. Our shoot was going to be filmed on Brasenose One (B1), so it made sense to have my practice run on there. I checked the Linear Fisheries Facebook page every day for a week before my session, to keep up to date regarding what was being caught. I also spoke to a few friends and people I knew who had fished the complex a lot over the years and I owe them a thank you for tipping me off to a few little tips. I also made sure to watch some of the more recent YouTube videos covering Brasenose One, just to pick up as much knowledge of the lake as is humanly possible and, when I arrived at the venue, I felt ready. As I drove around the lake I found peg 7 free which is one of the few pegs I’ve actually fished in the past. A few years ago I remember having a 25-fish hit, with carp up to 36lb, on a winter session. So having previous knowledge of the swim it was a no-brainer and, coupled with it commanding the centre of the lake, it was perfect for a few days angling as there were bound to be fish out in the central body of the lake. The first thing I did before setting the house up was fire three singles out onto the spot I wanted to fish – which was at 30 wraps (120 yards). The reason I did this was to try and nick a quick bite. When most people turn up to this venue, the first thing they do is get the marker rod out and thrash the water to a foam which can consequently spook the fish away from the swim. By spending the first few hours using either small bags or single hookbaits there is a good chance you can quietly catch a fish or two and get your session off to a flyer – before even getting the spod rod out. Once everything was set up I decided to start putting some bait in. The single hookbaits hadn’t worked on this occasion but with them already being in place, it was quite literally a case of spodding the bait over the area. The mix I decided to start with was a mixture of Cell boilies which had been washed out and soaked in Bailey’s liquor, Cell Response pellets and sweetcorn. Now, if you take just one piece of advice away from this article then please make it this – do not turn up to Linear Fisheries without sweetcorn. Regardless of what lake you decide to fish, they absolutely go mad for it, probably because over the years they’ve seen kilos and kilos of the golden grain and they now see it as the staple food within their diets. To start with I put 30 spombs of bait out. Going into that first night I wanted enough food out there to draw them down to my spot, then after every fish I’d put 12 more back out onto the area. The carp in these lakes are shoal fish and swim around in big groups with as many as 50 fish present! With that said it’s important to keep the bait going onto your area and even if I haven’t caught anything, then I will still put three to five spombs out every hour. The carp almost relate to the sound of the spomb hitting the surface (the ‘dinner bell’, if you like) and it’s not uncommon to get bites straight after spombing, as they follow the bait down to the bottom. On the rig side of things I started with my standard combi-rig, constructed using 20lb Kamo braid, 20lb IQ2 fluorocarbon and size 4 kurv shanks. The reason I chose this in particular is because when fishing at long distances, I don’t want to be using mesh bags or PVA foam because it hinders the distance you can cast. So, by using the IQ2 material, it gives you excellent anti-tangle properties. The other reason I decided to use this rig is because the hooklink is fluorocarbon – it’s virtually invisible to the carp and the rig/hookbait will appear more natural on the lake bed. Hookbait-wise I decided to start with three different presentations. On one rod I used a Mainline Baits’ Cell cork dust wafter, tipped with a single piece of sinking corn. On my second rod I used a Salty Squid wafter, and, on my third, just two pieces of pop-up corn. My thought process was that if I started to get more bites on any one in particular, then I could swap all my rods onto it. We all know from over the years that carp can be fussy and one day they will prefer a different flavour or colour and the day after it could have completely changed. The first night passed quietly, despite my high hopes, with fish showing directly behind my spot before sunset. I had set my alarm clock for 5am to recast my rigs at first light and freshen up the area with some more bait. With the fish responding to the sound of the spomb, I wanted to be the first one ringing the dinner bell in the hope that it would draw the fish into my area. This didn’t pay off and I had to wait almost 24 hours for my first bite, but eventually the left-hand rod ripped off. I landed a lovely, clean 25lb mirror and we were off and running. The bite came on the Cell cork dust wafter and fake corn rig, so immediately I wound the other two rods in and matched the presentation on all three rods. It is worth mentioning that before I dealt with the fish, I safely secured it in the landing net, whilst I put 12 spombs of bait back out onto the area. The feeding spells can be hectic, as well as short, so you really do need to maximise your time when the fish are feeding over you. If you decided to have a cigarette and a cup of coffee before casting back out you could be costing yourself fish. After spombing, I clipped a fresh rig onto my rod, wrapped it around my distance sticks and got my rod back out, first time. After I had dealt with the fish the spot really did come to life and I went on to land another couple of fish around the 20lb mark. This immediately told me everything was working. The spot was producing bites, the rigs were landing me the fish and the bait was catching them. What I would do however, if things went quiet again, is go back to my three different hookbait presentation and just keep the bait going in. The fish will turn back up in your swim eventually. Going into the second night I was stupidly confident in how things were going. I didn’t even contemplate the thought of not having a bite during the hours of darkness. Unfortunately, that’s exactly what happened and as first light came, my alarm clock sounded, which told me it was time to go to work on the swim. It was now Saturday morning and I only had 24 hours of the session remaining. This time however the early morning start paid off and within minutes I landed a lovely upper-double common. As I’ve already mentioned, I was here for a practice session so I wanted to try a few different tactics should I need them for the filming session. I decided to tie up three zig rigs at 12ft, 9ft and 7ft with yellow foam, black foam and red foam. I was fishing in 14ft of water, so I would pretty much have it covered. The yellow foam would imitate sweetcorn, the red foam would imitate a maggot and the black foam would silhouette against the sky, making it stand out to the fish. What also made me try the zigs was that there were plenty of fish showing and not enough action on the bobbins which told me they were up in the water column. It didn’t take long and I was into a fish straight away. I took my time with this one as I was using 11lb zig line with a size 8 wide-gape hook, and an angry carp on the end sometimes isn’t a good combination. When I eventually landed the fish it was a cracking 21lb mirror and I was chuffed to bits that I had another tactic I could now fall back on should I need it. For the record, it took the 7ft zig with yellow foam. As we went into the afternoon things went a little quite again with very little happening around the lake. Both Brasenose One and Brasenose Two over the years have built up a reputation of being ‘runs waters’ – however things are changing. The lakes are more pressured now than ever before and the fish are getting older and wiser. Couple that with the tactic of using natural baits like maggots and worms, and it seems to have made the fishing slightly more difficult. I’m not saying you can’t go and have big hits anymore, because when the fish are on it and feeding, you can without a doubt. However, the lakes can now be regarded as a bit tricky, especially if they shut down, which every now and again they have a habit of doing. With that said, a fish actually showed literally five yards out from the bank where the weed just started on top of the shelf. I quickly made up an IQ D rig and using a ball of worms as a hookbait, flicked it out into the area where the had fish showed. I then went about putting two spombs of chopped worm over the top and when I say it happened quickly, it happened quickly. After maybe a minute of my rig being in the water, I was away, with a lovely 24lb scaly mirror. With this success I decided to add a kilo of chopped worm to my spod mix to see if this would make a difference to my spot. Once the rigs were refreshed and the spot ready for the final night I rebaited with the chopped worm and decided to order a takeaway and have a social with Rich Shenton. We were just about to tuck into a pizza when my middle rod signalled a funny take. I hit into the fish and after a long slow battle I landed what looked to be a decent fish. After getting my rod back out onto the spot we dealt with the fish which weighed 34lb – what a result! 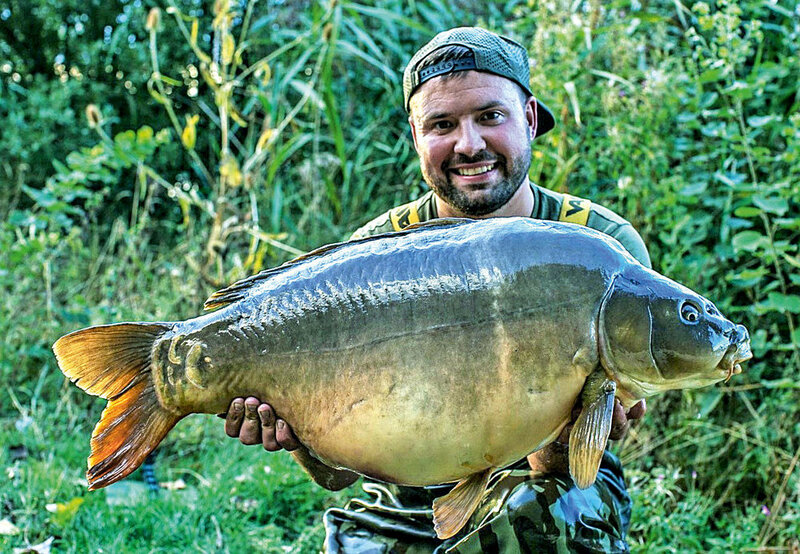 As far as I was concerned this was job done and although I went on to catch quite a few more fish through my last night and the next morning, the 34-pounder was without a doubt the highlight of the session. The following morning my time had come to an end and I’d managed 16 fish in the time we were at the venue. That may or may not seem like a lot of fish considering the stock that the lake holds, however, when you consider I fished on a bank holiday with 42 anglers fishing in 42 pegs and only three of us caught, I think that speaks volumes. The lake had turned off to a large extent, so to even get a bite was a result. It just goes to show that if you fish sensibly, work your swim and remain confident, you can get bites regardless of the conditions. Linear Fisheries needs no introductions but whether you’re after bites, big fish or even both, this venue has it all.